Oktoberfest. The 16 day Bavarian celebration was finally here. And it wasn't only about sausages, pretzels and beer. Five kinds of wurst (sausages), Schweinshaxe (pork leg), spatzle (handmade dumplings), sauekraut (fermented cabbage), pretzels and plenty more. The beer came in pilsner glasses not in litre mugs, we sat at trestle tables on cushioned benches under striped blue and white tents (sort of), cutlery and condiments on each table. What was missing were waitresses in dirndl dresses. But never mind, the serving guys were doing a good job, it would have been nicer if they had dressed up to "suit" the occasion. Another day, another invite to review the ongoing Oktoberfest at Hyatt Regency Chennai. It was held in the alfresco area adjoining their lounge bar, 365 AS. There was pre-recorded German music playing and the whole place was awash with a purple glow - good for the ambiance but a challenge for photographs. Being a Monday, there were not too many people about. But as the evening progressed, more guests trickled in. But first, like all good beer festivals, we were offered a selection. My friend chose SNJ beer on tap, a local brew, I opted for the wheat beer Schneider Weisse as my favourite, Erdinger, was not available. Both beers were mild. And just right for the warm September evening. Oh bliss! We chatted with executive sous chef Manvinder Singh who had lived in Germany for 4 years, and chef-de-partie Roberto Zorzoli. 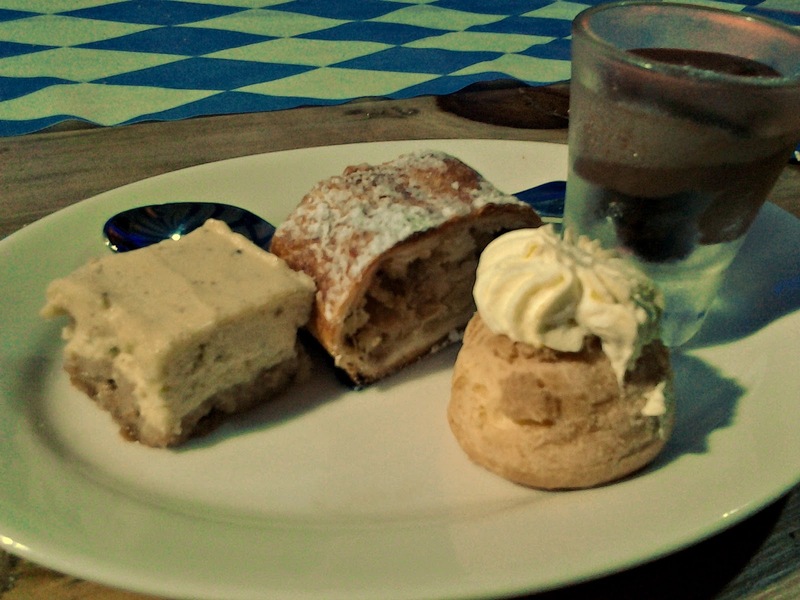 They told us that cuisine-wise, the lines blur between German, Austrian and Bavarian food during the festival. 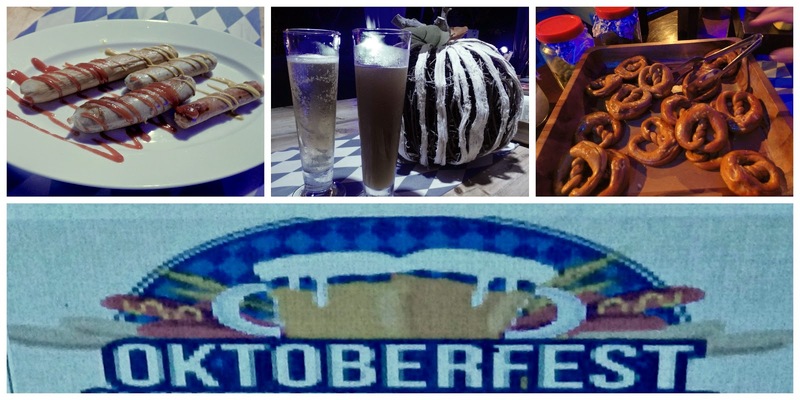 We also learnt that while Hyatt Regency Chennai was celebrating its third Oktoberfest this year, the menu had more dishes than what was served at the previous two. The food was laid out across 2 counters. We stopped to admire the rolls - pumpkin pumpernickel (what a tongue twister!) 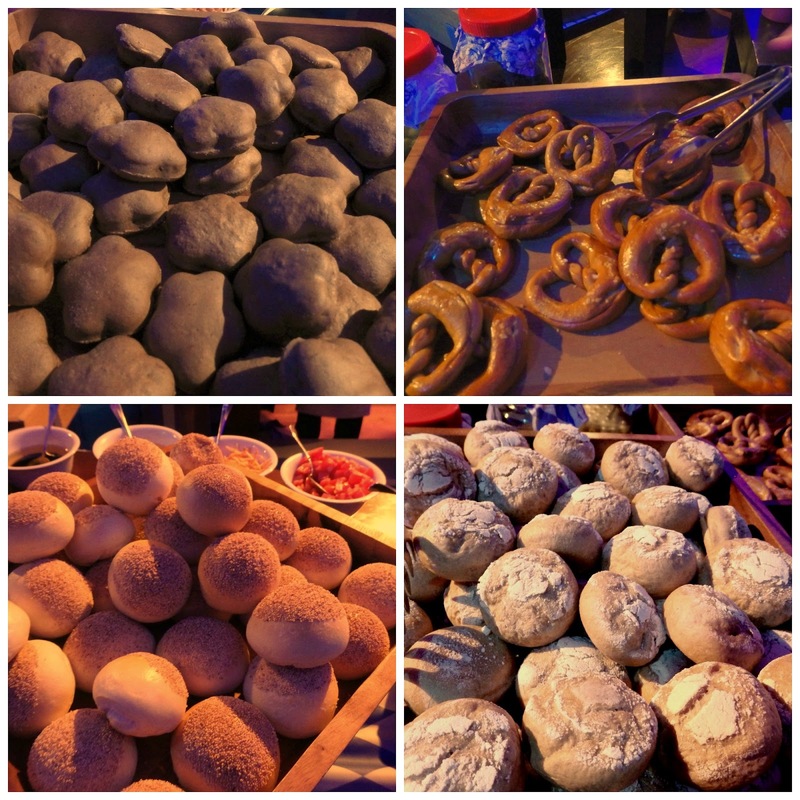 which looked like smooth lava stones under the purple light, kaiser, pretzels and sourdough. The best were the kaiser rolls. I do wish the rolls had been kept warm under a napkin. Sharing table space was a great big bowl of German potato salad. And a platter of green bean almondine. We loved the potato salad with its delicious dressing, also the beet and orange salad. Some of the beans in the bean salad were a little too mature. At the carving station, there was a whole honey roast pork leg. It had been marinated in honey and mustard and roasted to a beautiful dark gold. Slices were sent to the table. While the meat was well done and moist, the marinade had not penetrated the meat. 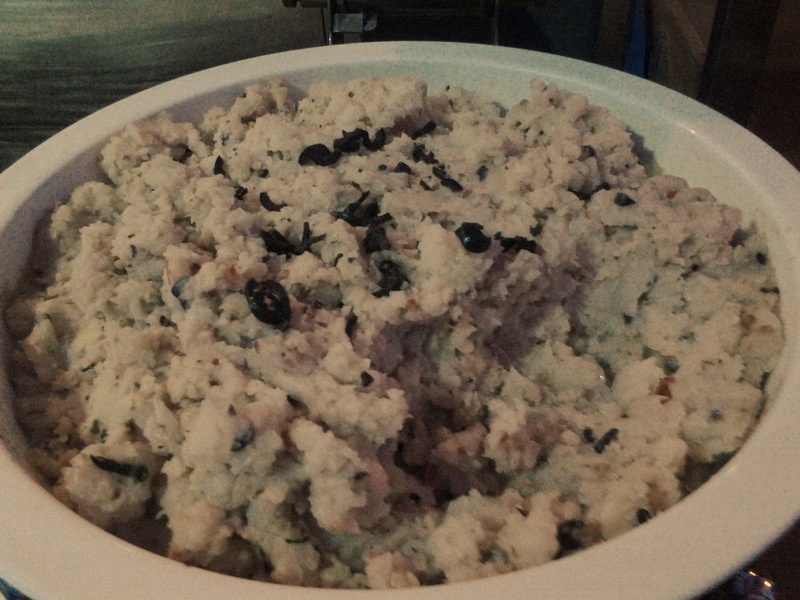 The other offerings included this crusted potato and sundried tomato mash. There was an unfamiliar aroma when we opened the cloche, the chef revealed it had been cooked with wine. The mash was served as quenelles along with slices of pork. What a great idea. The schnitzel was tough and dry. However the sauerkraut, made with red cabbage, was delicious. The spaetzel was another delicious dish, tangy with the flavour of tomatoes. And of course, the sausages. Along with bratwurst and frankfurters, there were also ones made of lamb. The mouth-watering sausages, lightly grilled and served with squiggles of tomato and mustard sauce, had been flown in for the festival. The chefs plated the food and sent it on to us. Sitting under the striped canopy, sipping beer and munching on the festival food, it was wonderful start to the week. 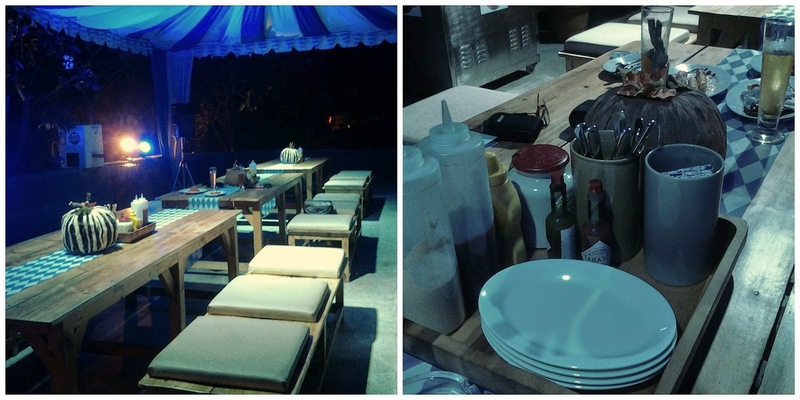 Overall, we loved the variety on the menu and the fact that the food was light. And when we finished, plates of desserts appeared. Could we really eat all this? There was a tasty pumpkin cheesecake, a slice of apfelstrudel with a delicious filling, a shot of absolutely decadent chocolate mousse and a choux bun with orange flavoured cream. I did wish the strudel pastry was crisp and that it had been served warm. It was an enjoyable evening, what with our glasses filled regularly, good music, really good food and great service by Ronald and the crew. 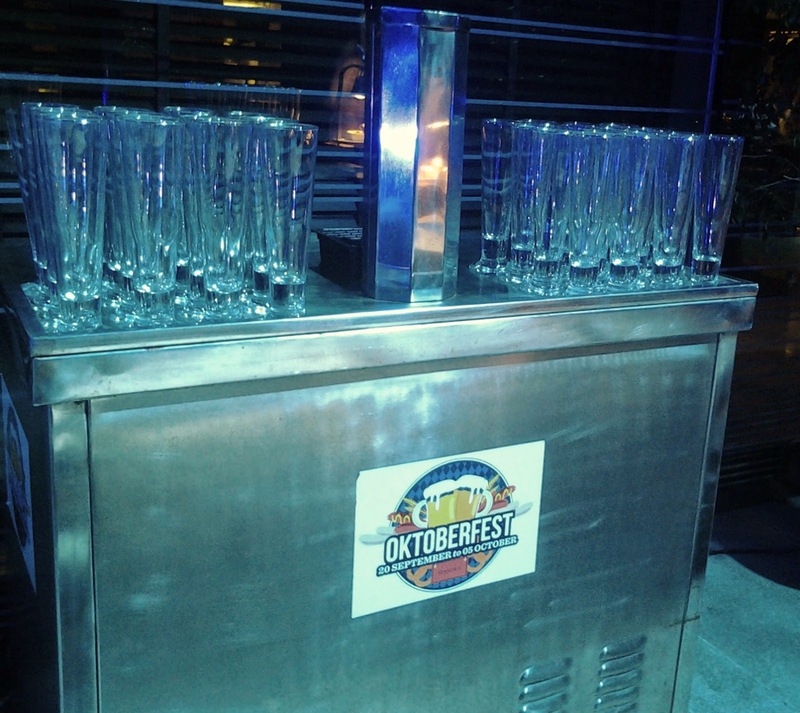 Hyatt Regency's Oktoberfest will be on till October 5th (Sunday) and costs 1444/++. And it's unlimited. If you miss this one, remember it will be 365 days to the next Oktoberfest! !